The story of these gates came to us through ancient Egyptian stories, probably inherited from Atlantis. It talks about two points in space situated at the meeting points of the ecliptic and the galactic midplane. Our galaxy, if looked at from outside of it, looks like a flat disc. This is what we call the milky way, a concentration of stars along a flat axis, called the galactic mid-plane. The earth ecliptic and the galactic midplane have a 120˚ tilt. The golden gate situated near the Scorpio constellation, is in the direction towards the galactic central sun. 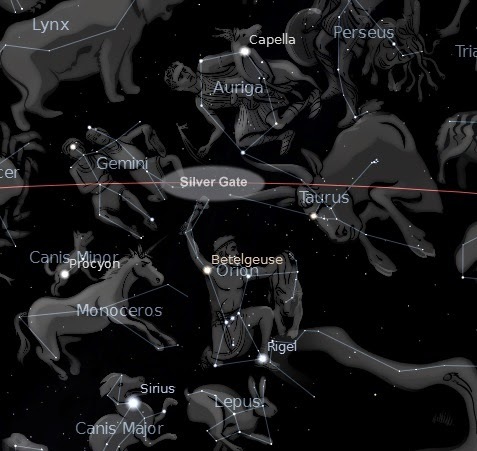 On the other side the silver gate, near the Taurus constellation, is in the opposite direction of the central sun. 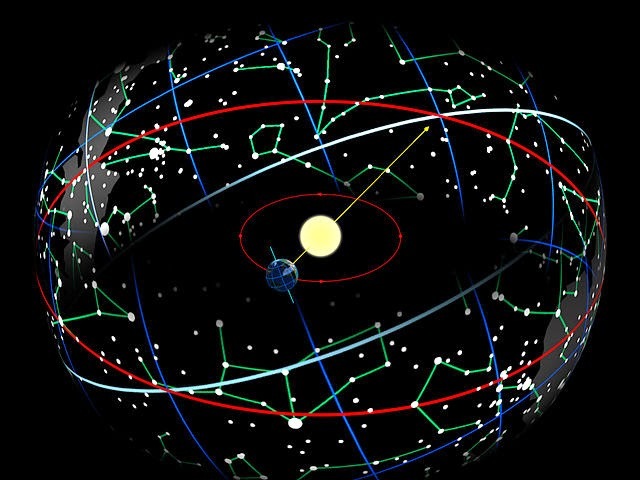 Every month our sun and earth align with a different zodiac constellation on the ecliptic, for example in May, we align with the Taurus constellation. It is interesting to note that near the golden gate is the constellation Ophiucus, a constellation that isn't considered to be part of the zodiac by the main-stream, but that does touch the ecliptic, and is therefore considered by some to be the 13th sign in our zodiac. This makes sense since zodiac signs are connected to our months, which are connected to our lunar cycles, and the moon goes around the earth 13 times during the time it takes the earth to revolve around the sun once. Many ancient calendars had 13 months a year. It has also been said that because of the earth wobble, the ecliptic points towards Ophiucus late november/early december for only half of a procession of the equinox, and then points towards Orion late may/early june for the other half of the procession of the equinox, which is roughly 13000 years, a number synchronicity with our 13 months. We would therefore have 14 zodiac signs, but only 13 each year. Orion and Ophiucus are pointing exactly at the Silver Gate - Golden Gate axis. In Secrets in Plain Sight, Scott Onstott shows a very clear obsession the controllers of our world have with these two gates, referencing it a lot in architecture, movies, etc, the most striking examples being the golden gate bridge in San Francisco and the vatican flag depicting a silver and a golden key, perhaps symbolizing the way they seek to lock these gates. Scott Onstott also showed that the metal silver resonates with the moon, which is a feminine archetype, and that gold resonates with the sun, masculine archetype. The silver gate is located between the horns of Taurus, the bull, sign ruled by Venus, which is another name for Isis, divine feminine archetype. Isis is usually depicted with horns and the silver gate between them in a very prominent way. The enslavers of our world have sought to hijack this energy in their financial system, with for example the $ symbol (2 i and 2 s) standing for Isis, the famous bull statue in front of wall street, and the word for money in french being 'argent', which means silver. Money is obviously linked to our sense of being nurtured, supported and connected to our environment by the ability to create in it. When one is in the enslaving system and deprived of money, one can feel alienated, abandoned and all alone, disconnected from Unity, which is the feminine energy. I believe that the enslaving system seeks to hijack and control Isis for their own sick purposes, but that the true essence of Isis is that of Divine Feminine, which is Unity, providing every body with the abundance of all creation. On the other side, I'm logically assuming that the golden gate is linked to Isis's complement Osiris, divine masculine archetype, whose story of death, rebirth and underworld resonates with the zodiac sign Scorpio. The Scorpio sign is often considered to have three stages of evolution, the scorpion, then the snake, then the eagle. 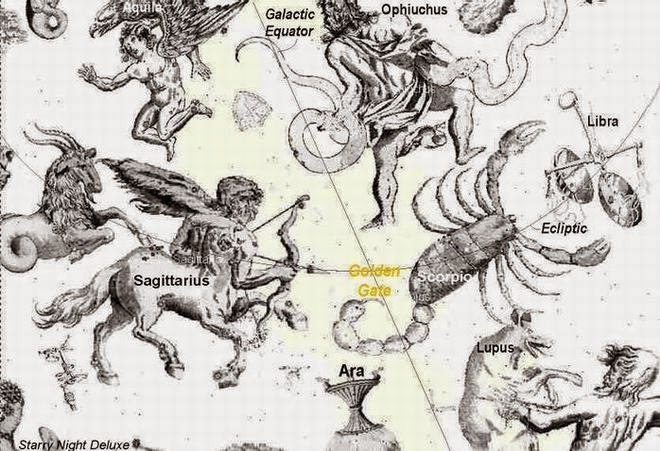 It's interesting to see how, if we go from the galactic center towards our sun, after passing through the golden gate near the Scorpio constellation, we pass through the snake of the Ophiucus constellation, and then through the Aquila (eagle) constellation, as seen on the above picture of the golden gate location. Then we pass through our solar system, towards the silver gate. As seen on the above picture of the silver gate location, just before entering the silver gate we pass through the Lepus constellation, and then the Orion constellation. Orion in ancient egypt represented Osiris. Lepus was said to be Osiris's boat to journey every night to the underworld, situated through the silver gate, by following Anubis's lead. Next to the Lepus constellation is the Canis Major constellation, the dog, that the ancient egyptians associated with Anubis, dog-headed deity. The Lepus constellation is nowadays depicted as a white rabbit, a widely used symbol in nowadays media, for example in Alice in Wonderland and Matrix, the white rabbit is followed down the rabbit hole, where we can choose between two paths, cakes that make you tall or small, blue pill and red pill, one of these paths leading into another world. 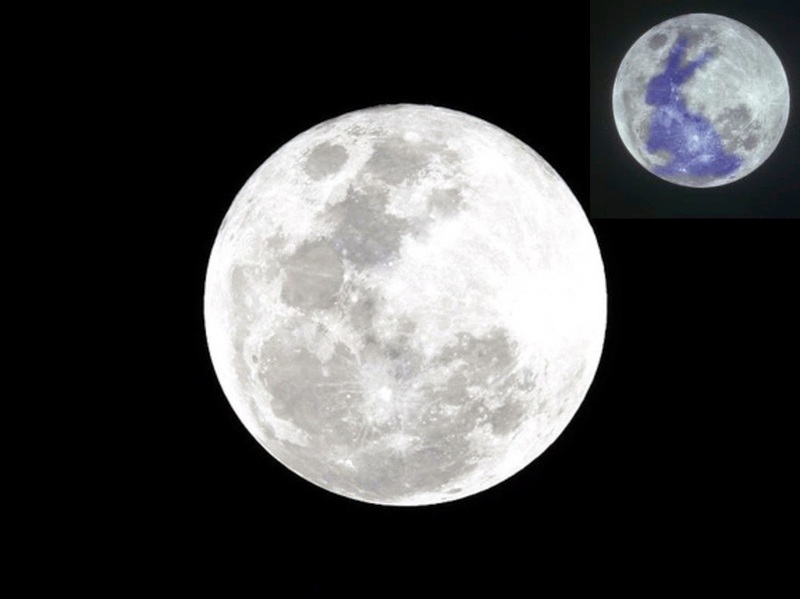 In Matrix, Morpheus even says "you take the red pill, you stay in wonderland, and I show you how deep the rabbit hole goes"
As an additional synchronicity, many cultures have seen a hare (guide towards the silver gate) on the surface of the moon, feminine archetype linked to silver and silver gate. Additionally, Ophiucus seems to actually represent Isis. This constellation depicts a snake handler, a feminine attribute associated with many Goddesses. The myth of Ophiucus is that of a man healer who resurrected Orion. 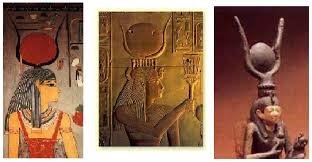 Isis is a woman healer who resurrected Osiris. The Ophiucus myth is part of ancient Greek mythology, which is composed of stories that were passed down from ancient Egypt, sometimes losing their essence in the process. As we know, Orion is actually Osiris, and therefore Ophiucus is actually Isis. This constellation was removed from the mainstream zodiac in an attempt to suppress divine feminine energy, disconnecting people from the 13 zodiac/moon cycle by changing the calendar, and hiding the Isis constellation by changing the myth. Osiris is usually depicted with the crook and the flail. The flail having three branches reminded me of Shiva's Trident, another masculine archetype who has three aspects like Scorpio/Osiris and whose theme of creation/destruction resonates with death/rebirth. This theme doesn't need to imply suffering, but is here to express the movement/action/masculine aspect of life, creating cycles, different forms and shapes, and transitions into different worlds. To sum it up, as seen on the constellation maps above, Orion/Osiris (masculine) and the Taurus (feminine) are pointing at the Silver Gate (feminine), and Ophiucus/Isis (feminine) and Scorpio (masculine) are pointing at the Golden Gate (masculine). This is a perfect mirror, representing how balance is needed in all things. The path that goes from the galactic center towards our sun, through the silver and golden gate, is the milky way, which was considered in ancient Egypt to be the celestial river upon which Osiris's boat is sailing. Silver and golden gates can explain the essence of feminine and masculine energies, and symbolism attached to it has been widely used in our world. I believe it can tell us a lot about the dynamics of our reality. There is surely more to discover about this and i will keep publishing my research about it on this blog. C : It is actually the main axis of evolution in this sector of the galaxy, if we look towards the galactic central sun you have the Antares star which is a stargate that goes in that direction, and in the opposite direction you have the Aldebaran stargate, which goes in the other direction. On the galactic scale it's like one of the galactic highways, through which many civilisations send their lightships. And there is also a strong flow of galactic energy going along that direction, and that galactic current allows different civilisations to evolve deeper into Oneness. Thank you for your enlightening essay! remind me of these G-8's or 7-8's. The 78 records of the past, replaced by 33's and 45's. ( totalling 78 ). 78 tarot cards in a deck as a reference to the 78 directions in a cube of space. I see 78 seats in a courtroom. 42 on the plaintiff/creditor side and 36 on the defendant/debtor side. Can we make a geometric connection to the Babylonian Talmud as THE book on master/slave relations? As it is the reference to the Jerusalem Talmud and it is also the masonic bible what is the geometric form within that set of documents? really interesting comments Billy... thank you !! Hello SGD! I really am looking forward to reading Townley's books! Very interesting. I have looked for correspondences between the tarot cards and the cube, and i can see the 22 major arcanas representing the center, 3 dimensions, 6 faces, and 12 edges, the edges surely being the 12 cards corresponding to the 12 basic zodiac signs. But i'm confused as to which is which, it seems the mainstream tarot is distorted so it's difficult to find meaning, and i haven't found an interpretation of correspondence that feels correct to me yet. 7 being the inverse of 1 is quite interesting, i can see that it is one meaning given to it, in french seven is written sept but pronounced set, the evil god of ancient egypt. But as always the evil interpretations are distortions of true meaning, and source is pure harmony, so The 7 can also be seen as written almost exactly like 1, and representing the rainbow, the 7 colors..
yes, certainly got me thinking about a book that i have about the cube and time/space configurations... been meaning to read it as i've only glanced at it so far... and i've been thinking about it for a week or so now... but this reminded me again. i'm going to look into these points you've made... thank you! feel free to forward info anytime... all so very interesting! If one were to have their astrological MC posted at the Silver Gate, and their Sun Conjunct the IC, or Golden Gate, by 4 degrees,what advice would you have for them?